Alexander Serov (Tinkoff) attacked breakaway companion Mark Cavendish (T-Mobile) on today’s stage of the Tour of Britain to create a stunning solo win on the tough uphill finish in Kendal. Earlier in the stage, Serov and Cavendish had broken free of a ten-man group that had struck out from the bunch only three miles from the start in Liverpool. In the closing miles of the race, Serov proved too strong for Cavendish on the hills, leaving the T-Mobile man to the mercy of the chasing bunch. By the time Cavendish crossed the finish line, Serov had gained 1-43 and the bunch, lead by Romain Feillu (Agritubel), came in only two seconds after the Manxman in a gripping finale to the day’s racing. 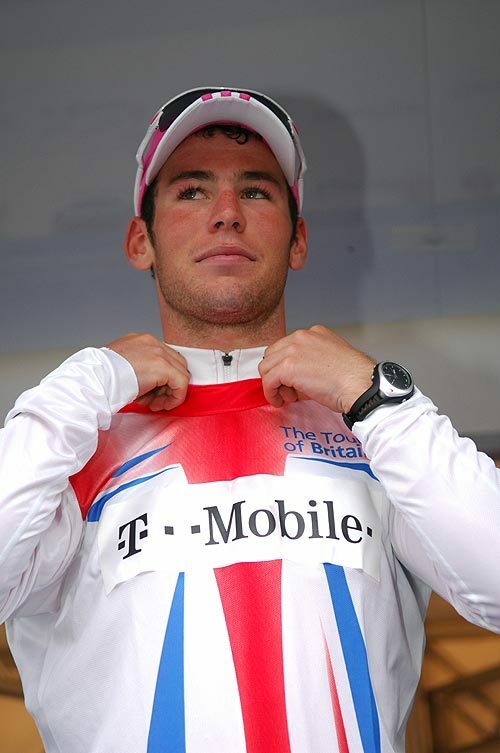 Cavendish accrued enough hot spot sprint points en route to grab the Sprints jersey. Fellow Brit Ben Swift retained the King of the Mountains jersey for another day. In the overall standings, yesterday’s stage winner Adrian Palomares (Fuerteventura-Canarias) did enough to keep the yellow jersey, but with only one second’s advantage over second placed David Blanco (Duja Tavira) and only three seconds ahead of Feillu. Feillu is by far the best sprinter of the top trio, which means it will all come down to tomorrow’s final stage from Dumfries to Glasgow to decide the winner. 10 John Bellis (Great Britain) all at same time.